Opened in 2012, the Sir Jack Brabham Automotive Centre of Excellence is a $10 million, state-of-the-art facility devised to offer the very best of training environments for the automotive professionals of the future. State-of-the-art equipment for learners training in collision repair, including the latest technology in spray booths and body repair systems. A modern kitchen and alfresco dining including BBQ area. The headquarters for the Motor Trades Association of Queensland (MTA Queensland), the peak body representing Queensland’s automotive industry. The home of MTAiQ, Australia’s first automotive innovation hub, supporting entrepreneurs and start-ups as well as existing businesses needing guidance and support to transform and adapt to market opportunities. MTA Institute Trainers are recruited from industry, not the classroom, and are therefore highly experienced in the real world automotive industry. As well as training being offered in the MTA Institute, our esteemed trainers are also based Queensland wide and training is offered offsite. 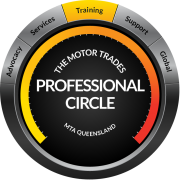 MTA Institute is also part of the MTA Group comprising of Motor Trades Association of Queensland (MTA Queensland). Through advocacy and consultation, MTA Queensland works closely with governments both state and federal, and other decision-makers, to shape policy development and ensure positive outcomes for the industry. To help achieve this, the MTA Queensland comprises 11 separate divisions, each representing a specific industry sector. The chairperson of each division represents the interest of their industry sector through their position as a member of the MTA Queensland Board. MTA Queensland is also committed to helping automotive businesses to be at their best, and works to achieve that goal by providing businesses with the services, support, advice and advocacy they need to make their organisations successful. Introducing the MTAI Professional Circle… a new concept that encompasses, above all, professionalism.